Our Hearts of pleasure are filled with great Smoked chocolate! You or your favorite person must try Smoked Chocolate! Sometimes you need a special dessert or treat for that occasion that you want to express your love or appreciation. An anniversary, Valentine’s Day, Sweetest Day, or even as a thank you gesture. I have the perfect treat that is simple to make and allows you to customize the ingredients to fit the preferences of the recipient. 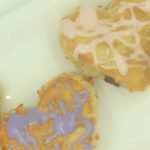 I’ll give you my version of the Heart Puffs of Pleasure but know too, you can change the shape of this treat to any cookie cutter shape you find adorable to use. It all starts with adding a bit of smoky flavor to some of the filling ingredients so let’s start there. 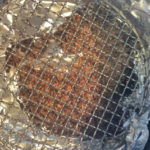 I’m using my DIY stove top smoker technique which uses a standard stock pot and a round roasting rack for the smoking. You can visit our previous posting on this technique on our Tips & Techniques Blog. I placed Sugar Maple Minuto® Wood Chips in the base and will smoke 2 of my filling ingredients: milk and dark chocolate and peanut and cashew pieces. I’m also including shredded coconut in my filling but I’ll just do a light toasting of this in the oven. Before smoking, I break up the large chocolate bars to allow for easier smoke infusion and place in heat tolerant containers. The nuts will be smoked first since I’m using a hot smoking technique for them, then I’ll remove the pot from the heat and put the chocolate pieces in to infuse with the remaining smoke vapor. It’s important that you quickly remove the nut container and reseal the pot in order to keep the smoke vapor generating. If needed, keep the pot on the burner for a few minutes after the nuts have been removed. Then take off the heat, allow the pot to cool slightly, then add the chocolate pieces container. Tasting Notes: Although you can select any ingredients you want for your stuffed puff pastry design, be sure you understand which ingredients are appropriate for hot smoking and which would require cold smoke application. Remember, items that traditionally melt with heat will melt from any temperature above 80°F. Here’s the fun part of this treat! Selecting the design shapes you want to encase your great fillings in. I’ve decided to do heart shapes in two sizes: a 4-inch and 3-inch heart using cookie cutters. Using store bought puff pastry sheets, I thaw according to the package directions and then lay one sheet out on a board. I place my cookie cutters on the pastry sheet spacing accordingly so I end up with four hearts per sheet. Remember, you will need a top and bottom pastry heart for each treat. I’m using a total of four pastry sheets which will provide me with three large finished hearts and six smaller. Simply cutout the heart shapes and place on a parchment lined sheet pan. Keep the pastry cold until you are ready to fill them, with a damp cloth placed over the hearts to keep the pastry from drying out. With our filling choices smoked, it’s time to start assembling the pastry hearts. 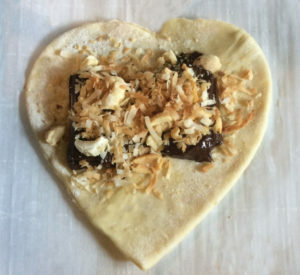 Start by placing three pieces of smoked chocolate on a pastry heart followed by the other fillings. In my case, that’s a spoonful of smoked nut pieces and toasted coconut. 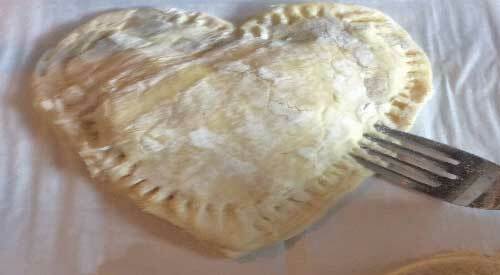 Place a second pastry heart over the first and pinch the edges together. I secure the edges in place by using the tines of a small fork which also adds a decorative edge. Then egg wash your finished pastry heart. 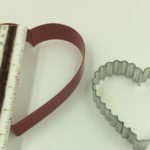 Continue with the other pastry cutouts until complete, noting that the smaller hearts will take just two pieces of smoked chocolate. Do not allow the fillings to go to the pastry edges. Once all the puff pastry hearts as filled, sealed, and egg washed, it’s time to place the prepared sheet pans into a 375°F oven. These will take between 15-18 minutes to become golden brown and “puffed”. It’s important that you check the bottom of the pastry hearts to ensure they are golden as well so there are no raw dough segments. Once baked, remove from the oven and place on cooling racks. These must be cooled completely through before attempting to ice. While the pastry hearts are baking, you can make icing to drizzle over the tops. Be sure you cool the hearts completely before icing otherwise you’ll end up with a thin, melted icing. To make the icing, combine powdered sugar with milk or cream. I take about 3 tablespoons of powdered sugar to 1 tablespoon of milk or cream and mix well. I like a consistency that is the thickness of gravy so I can control the drizzle on my finished pastry. For coloring, I like to use gel food colorings which require much less coloring and have a greater variety of colors available. I decided to use violet, pink, and red though my red was more of a deep pink as I used such a small amount. When the pastry is completely cool, I use a spoon to drizzle the colored icing over the top of each heart. Allow to dry for about 10 minutes and you’re ready to serve. Here’s the best part about our puff pastry hearts. They can hold any fillings you can think of. Whether sweet, savory, spicy or other, you can make these with all types of ingredients. And the pastry can be cut into any shape and size. Consider the person you’re making them for, the special event or occasion, and then have fun customizing them. Even with the stove top smoking components, these can easily be made in under two hours. Try our technique and create a truly unique and flavorful result that will be appreciated by the recipient! What’s your favorite filling to use in a stuffed puff pastry? Leave us a comment to opine and subscribe to get all our postings on tips, techniques and recipes. Bringing innovation to wood fired cooking with recipes, techniques and the science behind the fire, smoke, and flavor. That’s SmokinLicious®. 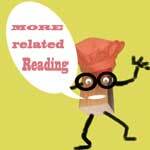 For more reading related to smoked Chocolate and other great recipe ideas! 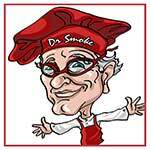 Dr. Smoke- I Love the taste of Smoked Chocolate! Try these puff pleasures for your favorite person or just for yourself!